A box of five delicious handmade heart shaped macarons filled with a luxurious champagne and strawberry white chocolate ganache. The perfect Valentine's day present for the one you love! These macarons are handmade using free-range eggs and the finest local ingredients. 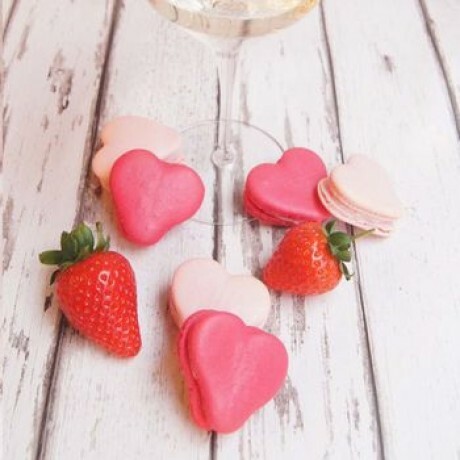 What says 'I love you' more than hearts, Champagne and macarons! Free-range egg whites, ground almond (nuts), icing sugar, white chocolate (sugar, whole (milk) powder, cocoa butter, emulsifier: (soya) lecitin, natural vanilla flavouring), Champagne, freeze-dried strawberry powder, cream (milk), glycerine, silicon dioxide, propylene glycol, colour: E122.